Based on their historical relationships with rents and incomes, San Diego home prices are now reasonable. Neither ratio is at its all-time low, but both are firmly in the middle of the range that prevailed for two decades before this latest bubble blew the valuation metrics sky-high. The price-to-income ratio would have to fall 15% from December's level to equal its all-time low hit in 1997. The price-to-rent ratio actually hit its low in the prior cycle, in 1986. It would have to fall 22% from here to hit that level. Of course, given the exaggerated bubble-time overshoot to the upside, it's reasonable to believe that valuations could overshoot to the downside and set new lows. On the plus side, these charts use the December Case-Shiller release (the most recent), which as I've often discussed best reflects November 2008 pricing. Home prices in the real world have dropped a bit further -- and the ratios gotten a bit better -- since then. These charts aren't supposed to serve as timing indicators or to give buy and sell signals. They do not take account of external factors such as unemployment or foreclosures. They don't account for potential changes to future rents and incomes. And they aggregate the whole county into a single number, ignoring important distinctions between different sub-markets. What the charts do provide is a broad-stroke view of how expensive San Diego homes are, in aggregate and compared to history, when measured against the region's average rents and per capita incomes. 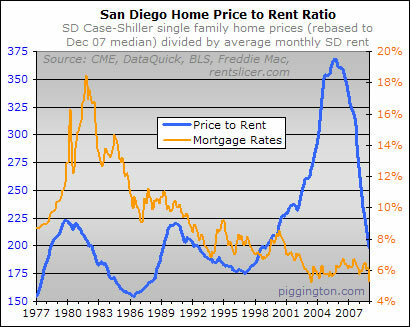 And these indicators say that while San Diego real estate as a whole is not dirt cheap, it's perfectly reasonable. Another way to measure valuation is to compare rents and incomes not with home prices but with monthly payments. While this provides some good context, I do not favor this valuation technique. For one thing, mortgage rates are artificially low, with the Fed monetizing into a mortgage market that was already underpricing long-term inflation risk to begin with. But that is just a subset of the general problem with this approach: rates change, and if you are trying to determine long-term sustainable levels of affordability, you have to consider the path of rates over said long-term, not just during a given month. But the recent bubble is an aberration in which home prices rose not due to low rates but to an extended period of incredibly reckless mortgage lending. Looking back beyond this risky-lending-induced bubble, there just isn't much historical data to suggest that homes should necessarily be more expensive when mortgage rates are low and less expensive when rates are high. All that said, monthly payment levels do have an impact. They feed into the rent-vs-buy decision, for instance, which in turn influences demand for housing. So they are worth looking at -- they just shouldn't be looked at in isolation. The payment-to-income ratio is 3% below and the payment-to-rent ratio 6% below their respective all-time lows, both hit in the 1990s downturn. 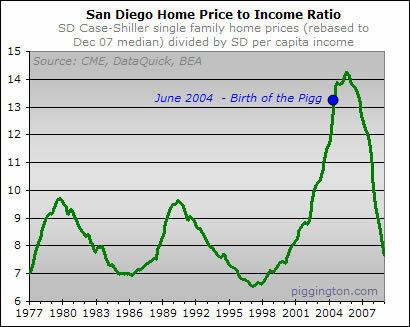 So by this metric (for what it's worth, which per the above is questionable) San Diego homes are cheaper than they've been since this data began. But even by the superior price-based indicators shown earlier in this article, San Diego home prices are now reasonable. So despite everything else, the San Diego housing market has that going for it. Finally. Submitted by AN on March 25, 2009 - 6:18pm. I hope we'll undershoot just as we overshoot. Submitted by 34f3f3f on March 25, 2009 - 8:00pm. Theres only so much extra people will pay to be 5 miles closer to the beach - which is why the areas with price drops are selling lots of houses, while inventory in higher priced areas (like the coastal areas) is sitting frozen by and large. This says it all. There will be such disparity, and buyers are going to question whether buying in a traditionally better area is worth it, when so many better deals can be had elsewhere. I expect that realization will slowly filter into middle class "I'm alright Jack", but when it does, the absurdity of California house prices will come sharply into focus. Then we'll all be ensconced in (California) normalcy. Submitted by poorgradstudent on March 26, 2009 - 1:58pm. Both the rise and fall rate of the Price to Income graph are unprecedented. The two previous peaks had 6-8 year market declines. If trends continue, we're looking at peak-to-trough in less than 5 years total. When this recession ends and job growth resumes, the housing market should bottom out. I'm personally planning to buy in 12-18 months (as much for personal finance reasons as market timing). Like the stock market, there's no point in trying to catch a falling knife: better to wait until we're a couple months into the rebound. Submitted by CricketOnTheHearth on March 26, 2009 - 2:14pm. I think my favorite "undershoot" graph is the one that esmith made a week or so ago. Submitted by Rich Toscano on March 26, 2009 - 8:14pm. Hi Piggs -- In writing up the payment ratios for voiceofsandiego.org, I thought of a couple things I didn't mention in this article. I will excerpt them below. Courtesy of a recent move lower in mortgage rates, the graphs actually overstate monthly payments at this point. The graphs are only updated through December 2008, which is the most recent month for which the Case-Shiller home price index is available. So the final figure uses the average December mortgage rate of 5.29 percent. But as of this week, according to Freddie Mac, the average mortgage rate has dropped all the way to 4.85 percent. Using the 4.85 percent rate with December's home price data, the payment-to-income ratio would be 7 percent and the payment-to-rent ratio 10 percent lower than their respective prior lows. And you could probably add a further couple of percent to those figures based on the likely prospect that home prices have fallen more since December. The payment ratios, while not a great valuation metric, still contain useful information. These ratios feed into the rent-versus-buy decision being made by potential home buyers throughout San Diego and accordingly impact potential housing demand. But that impact is fleeting -- it only lasts for as long as rates remain at this level. Rather than using the payment ratios as an arbiter of sustainable price levels, it makes more sense to think of them as a "market factor," similar to foreclosures, unemployment, and other dynamic elements that affect housing supply and demand but change constantly. In this case, the rock-bottom payment ratios are a positive market factor. Very positive. Mortgage payments are the lowest compared to fundamentals that they've been in three decades of data. But homes themselves, while no longer expensive, are still not cheap. Whole article is here if you're interested. Submitted by anxvariety on March 26, 2009 - 8:34pm. Maybe close to a bottom, but I think the top goes right along with it. Not that many qualified buyers anymore! "Wanting" a house does not equal demand like it used to. Submitted by drunkle on March 27, 2009 - 4:28pm. "So ... now what should good little piggies talk about?" about the chart... it's scary. really scary. that's the population boom/bust chart in which what follows is either extinction or flat, near zero population. in terms of housing, that would be either social collapse and barter town or prices going to zero and staying there. the chart has only barely slowed its rate of decline and yet it's already hit the lows of the prior 40 years. sd home prices may now be affordable, but it's heading straight to irrelevance. Submitted by CA renter on March 27, 2009 - 11:10pm. Space alliens have landed and taken over Rich's body!!!! Submitted by Huckleberry on March 28, 2009 - 5:52am. LOL, I think Rich has been kidnapped by NAR and they hijacked his website! Submitted by Rich Toscano on March 28, 2009 - 11:28am. It's true. Lereah and I are BFF now... I keep him company while he eats egg mcmuffins in his car. I'm also honored to have been hired as the person who gets to apply tanning cream to that hard-to-reach spot on Tangelo Mozillo's upper back. Now if you'll excuse me, I'm off for a grillout on George Chamberlin's patio. Of course, given the exaggerated bubble-time overshoot to the upside, it's reasonable to believe that valuations could overshoot to the downside and set new lows. Submitted by CA renter on March 28, 2009 - 1:44pm. Submitted by CA renter on March 28, 2009 - 2:00pm. -Many decades of wages increasing over time, spurring the notion that one should always stretch their finances to the max when buying a house because they could pay it off "with cheaper money" going forward. Maybe that can happen now, but I'm seeing very little evidence of rising wages going forward. -People had more secure jobs and still believed in the "one employer for life" model. This, along with an assumption of rising wages over time, made it seem logical to "buy as much house as possible." They also would be more willing to buy (and less concerned about timing market bottoms) because they figured they could better weather the ups and downs of the housing cycles if their jobs were fairly stable, or if they thought they could easily replace their jobs for similar wages. And finally, if interest rates didn't affect housing prices, why is everybody in the financial/political world doing everything possible to keep rates down right now -- especially when one considers the risks they are taking with our currency? If interest rates don't affect housing prices, let them raise rates to the sky!!! Man, would I love to see that! Submitted by patientrenter on March 28, 2009 - 2:28pm. 1. An individual who influenced many others to do irresponsible things, to the others' possible detriment and that of society at large. An individual who refuses to accept the enormity of what they did to inflate the bubble, and to accept responsibility. A society that doesn't hold them fully accountable. 2. Personal financial gains, even amidst the economic crisis, for those who participated in the bubble. Most people who bought more house than they need / can afford are still holding on to net gains, because they bought early enough, and the market has not been allowed to drop to its natural level. And most government actions are taken to help those people hold onto these unearned gains that distort our economy and make it less efficient for people who produce real goods and services. Submitted by Rich Toscano on March 28, 2009 - 3:57pm. You are right as usual, CAR... there were of course many factors feeding into this whole thing. But I do think that the securitization/e-z lending thing was the prime mover. Just to clarify, also, I didn't say that rates don't affect housing prices, what I was trying to say was that since rates change, payments are not as good a valuation metric as sales prices when it comes to determining whether houses are over or underpriced for the long term. Submitted by CA renter on March 28, 2009 - 7:19pm. We definitely agree on that, Rich. As for the securitization and EZ lending, I think that trend was really magnified by the low rates. We know foreigners hold a lot of this paper, but what's not said often enough (at least before the AIG scandal) is that pension funds, insurance companies and mutual funds were/are very heavily invested in this paper. They have a certain return that they **need** to get in order to stay solvent over the long-run. By keeping rates artificially low for so long, the Fed essentially forced all of these traditional, fixed-income investors into riskier and riskier investments. They essentially didn't have a choice, especially when you consider the losses they took after the dot com implosion. I hold the Fed accountable primarily because they created an environment where normally conservative, fixed-income investors were forced to buy all these Frankensteinish securities. All the while, banks and other financial institutions were making tremendous returns acting as the middle-man on these investments. They literally have destroyed this country, IMHO. Submitted by jpinpb on March 28, 2009 - 11:30pm. That guy should be working at McDonald's after his part and contribution to the damage that's been done. Also, we need to keep in mind that we didn't just have low rates - we had low adjustable rates. If you were able to get a 2% rate for 30 years, I would think things might be a little different perhaps. People took advantage of low rates to get their foot in the door, but knew it was temporary and hence commenced the flipping ASAP w/in 2 years and the hot-potato game started. Though we can say interest rates in the past did not have a direct correlation to home prices, this particular breed and strain and combination of ARMs and NINA and zero down is an anamoly that did not exist historically. If we factor all that in together w/e-z lending, you have the perfect storm. Submitted by poorsaver on March 29, 2009 - 11:25pm. So I guess there really is a "sunshine tax", since San Diego doesn't follow the national average of 3-3.5 times household income, as history has shown it closer to 4-5 times. Does that tax increase on April 1st as well? Submitted by FormerSanDiegan on March 30, 2009 - 9:12am. The "sunshine tax" is here regardless of the cycle. I moved to San Diego from the midwest in the mid 1990's. When we bought our ~1000 sf Clairemont 1960's stucco box for 160K in 1996 (within months of the bottom) the equivalent property in the inner ring of suburbia in the midwest would have been 60-70K. Submitted by coxapple on March 31, 2009 - 11:18am. 'Submitted by paranoid on March 25, 2009 - 12:45pm. Rich, Do you know the answer to this questions? Submitted by paranoid on March 31, 2009 - 3:00pm. I believe that the conclusion from the graphs presented in this article is misleading, because CSI is distorted by the mix of sales, just as plain median value does, just in a different way. CSI says that San Diego as a whole has lost more than 40% in housing price from the peak. I don't think this is correct. if you looked at the tiered values, you will see that the aggregate value (SD as a whole) is tracking mainly the low and mid tiers(<$400k)(see sdhpi.blogspot.com) where most sales are taking place due to REOs. This is because the aggregate is mainly accounting for Sales, not the volume of houses not for sales. I.e. areas (CV/La Jolla etc) where sale volume is very low are under represented in the CSI, while areas (like oceanside, chula vista etc.) where sales volume is very high due to REO are over represented in the CSI. The graphs Price/Rent, Price/Income are misleading in the sense that the sale mix today is very different from the mid-90s, due to today's very high REO proportion. So yes the housing pricing is getting better, but much less than the graphs would imply. There are many engineers on this board, I'm surprised that little doubt has been raised about these graphs. Submitted by FormerSanDiegan on March 31, 2009 - 5:49pm. Can you point us to a source that indicates what proportion of sales in the early-mid 1990's was due to REOs. My recollection of the 93-95 time frame was that they were a significant portion of sales. Submitted by paranoid on April 1, 2009 - 6:23am. FormerSD: you can find such data by looking at Rich's past posts on NOD/NOT, in particular the Sales / NOD (or NOT) graphs. Submitted by Rich Toscano on April 2, 2009 - 10:18am. concerns by weighting sales pairs. changed in quality or sales that are otherwise not representative of market price trends. are, therefore, given less weight than sales pairs with shorter intervals. ensure that the indices track the aggregate/average value of all homes in a market. So, they underweight homes with larger price changes and overweight high-priced homes. Both these adjustments would work to offset the phenomenon that paranoid described. That said it's a valid point to keep in mind. This is why I have tried to emphasize that these ratios are just one piece of the puzzle that provide a broad-stroke view of things -- and also that they don't account for big regional differences. However, I think they do provide substantial analytical value and I think it's a big overstatement to say that they are misleading or should be ignored. That btw is exactly what the bulls said when the p/i ratio was at 14. Submitted by bob2007 on April 2, 2009 - 6:17pm. jpinpb, I just read this thread and your post was a while back. But I think that if you can only put 3% down, you should not be buying, and that is why your calculations of rent vs buy dont add up to buy. Based on your financials, you should continue to rent. When you can go 20% down, buy. Submitted by jpinpb on April 3, 2009 - 1:14pm. I can put more than 3% down, but w/the way the economy is, I'd rather not tie up the cash. I'd rather have more funds available in case of emergency. That, and I think that if property values continue to decline, you are losing a lot of what you put down and who knows when you'll get it back. To me it makes no sense to put more down. I put 20% down when I bought in Carmel Valley during the early '90's and spent most of the '90's wishing I had the cash. And of course the house depreciated more than 20% back then. In fact, I think I ended up not able to refinance b/c of the loss of value and having to pay PMI. Luckily I was able to ride it out. But lesson learned. Why tie up the money if you don't have to. As long as I have it available, I feel comfortable buying w/less down. I don't intend to go in over my head and since the market is unstable, I want the numbers to add up. Submitted by djviking on April 5, 2009 - 7:50pm. Me thinks Rich may be eyeing a purchase at this very moment....softening the blow for his eventual announcement.....'member when OCRenter did this on his Blog......"the horror........the horror"
Submitted by jpinpb on April 5, 2009 - 8:07pm. I was thinking the same thing. He's prepping us. Submitted by Rich Toscano on April 5, 2009 - 9:38pm. Nope... just reporting the data. Submitted by masayako on April 23, 2009 - 9:08am. I agree 100%. I keep check of RB, RP, LJ, DM, SB, Poway, the price of a decent house in these locations are NOT dropping to a reasonable price yet. I guarantee you that. Most sellers are still holding on for their goldmines and hoping for $700k, $800k for their mac mansion house with a 5000 sq fts lots.